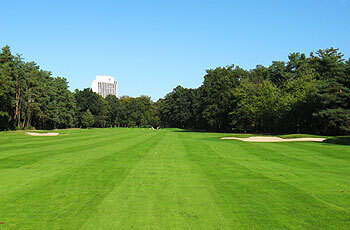 Frankfurter Golf Club is located in a secluded forest setting within the Frankfurt city boundary. The gently undulating topography is in many ways reminiscent of the sand belt courses located to the west of London. Unfortunately, a century of unchecked tree growth is suffocating the fairways today and the turf quality is markedly affected by the lack of sun and wind. A number of holes have become straight, tree-lined affairs with little strategic interest. The golf club itself is one of the oldest in Germany, founded in 1913. The original 9-hole course was the work of Charly Gardner and located on another site, whereas Harry Colt and John Morrison designed the current layout in the late 1920s in a traditional old English heathland style. Sadly, the heather is gone these days, with the exception of a small patch behind the fairway bunker on the 15th, which provides a glimpse as to how the course might have looked before the pines grew up. The club used to be a regular German Open venue (most recently in 1989) and it was once one of the longest courses in Europe with par set at an incredible 78. Today’s par at Frankfurter is between 69 and 71 depending on which tees are selected. Their youth program is one of the foremost in Germany, so betting against a 14-year-old lad heading for the back tee is probably a bad idea. While the rebuild has certainly improved the quality of the putting surfaces, it didn't exactly promote the ground game. Some critics feel the bunkering and green surrounds show little sympathy for Colt and the elaborate mounding is more in tune with the modern American style made popular by Robert Trent Jones. See other reviews from Wiedelmann Tim H.
Very good course in my view. After green renovation in 2008, greens are now top notch and on par with the best I have ever played, in terms of design and condition. Also club house, setting within the Frankfurt forest and practice facilities are great. Only criticism is that the course lacks any real challenge from the tees as course is neither long nor narrow nor well bunkered (except for the greens). Overall definitely one of the best courses in the Rhein/Main region (in my view in the same league as Hanau and St Leon). This is one of the great old courses in Germany and was a regular host of the German Open Championship between the 1930s and 1980s, with winners including Henry Cotton, Tony Jacklin and Severiano Ballesteros. It was built by Harry Colt in a location perfect for golf - sandy soil in the hilly forest south west of Frankfurt. While too short for today’s professional golfers, it still a tough test even for the strong golf enthusiasts as it measures 6,700 yards for a par of 71 from the regular gentlemen tees and a slope of 136.With every whole surrounded by century old oak and pine trees the course is a real beauty all year round. The start is tough with the first three holes par fours that measure between 415 and 445 yards (again from the regular tees). Other memorable holes on the first nine are no. 6 (a tricky short par 4 that doglegs to the left and gives an advantage to those players that can draw the ball) and no. 9 (another long par 4 with a tough shaped green). On the second nine holes the course becomes increasingly hilly, with some amazing driving holes from elevated tees such as no. 12, 15 and the famous 18, a 440 yard par 4 which finally offers a view onto Frankfurt’s skyline and requires a very precise second shot to an elevated green protected by a huge green bunker. While the three par fives are relatively short (in particular no. 15 and 17 are reachable in two by long-hitters), the par threes are very tough as greens are severely shaped and protected by bunkers. But the real challenge is caused by the par fours due to their length and clever fairway and green bunkering. Greens are very difficult but true and great fun to put on with heavily shaped surfaces after the club undertook a complete redesign of greens and surroundings by Christoph Staedler in 2006/07. This has been an excellent improvement as previously relatively flat and irregular greens had been the only weak spot of the course.After the round you should enjoy a drink on the terrace in front of the club house as it offers beautiful views over the practice green to the 18th green and over first hole into the forest. The course can be reached within 10 minutes from Frankfurt city centre and the airport, so take advantage next time you come to Frankfurt! This is a good course. It had once been a great course, in the times before redesigners over redesigners came to Frankfurt. There seems to be nothing left of the original Harry Shapland Colt design, except for the huge trees, maybe. I always ask myself what this course looked like in its good times. Still it is fun to play (and very, very hard), but as I said,it's been destroyed.